On August 1, 1966, a lone sniper shot and killed 14 people, and wounded many others, at the University of Texas’s Austin campus, over the course of a 90-minute spree. He did so while perched atop the school’s observation tower, giving him lines of sight that made it easy for him to pick off his prey, none of which were chosen for any reason other than that they were there and he wanted to shoot them. Now, 50 years later, long after we have become (sadly) almost inured to these kinds of events, comes a documentary film that tries to understand the horror of that day, not from the point of view of the killer, who remains faceless and unnamed, but from the perspective of the survivors and first-responders. 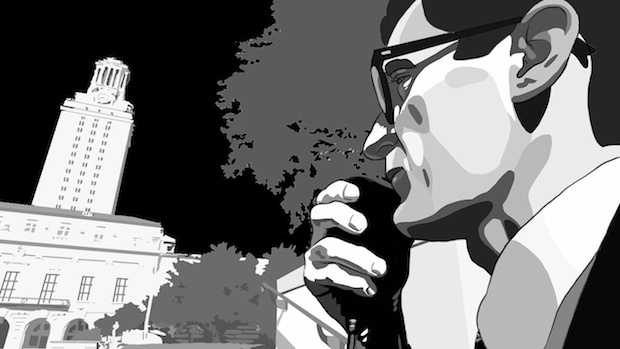 Crafted from limited archival footage and extensive reenactments, the latter of which are presented in black-and-white rotoscoped animation, as are the talking-head interviews (also reenactments, interpreted by modern actors, based on video interviews of the actual participants), the movie makes us feel as if we are right there in the moment. Which feels counter-intuitive, no? A documentary made from entirely recreated material – and animated, too! – nevertheless succeeds in placing us at the center of the drama? How can that be? Well, for one, we quickly forget about the animation; it was used in part because the filmmakers were not allowed to film on the U.T. campus, and this technique allowed them to take the filmed reenactments and insert them directly into the real location (according to producer Megan Gilbride, who described the process at the post-screening Q&A for the movie at AFI DOCS). On top of that, the film’s pacing leaves us no time for second thoughts about aesthetic motivation. Before we know it, we’re in the middle of a harrowing tale; by the time we ask ourselves whose voices we are actually hearing, director Keith Maitland (The Eyes of Me) switches gears and brings in the older versions (i.e., the real people) of the characters we’ve been watching, letting them pick up the details and further the narrative. It’s a masterful stroke, mixing these more traditional interviews with the reenacted ones, as it lends the whole affair an irreproachable air of verisimilitude. It’s an extraordinarily impressive artistic, as well as dramatic, achievement. Maitland is certainly not the first documentary director to use animation: Ari Folman, in his 2008 Waltz with Bashir (Oscar-nominated) similarly used animation to heighten the drama of unspeakable events, as did filmmakers Dee Hibbert-Jones and Nomi Talisman in their 2015 short Last Day of Freedom (also Oscar-nominated), which also used black-and-white rotoscoping, to name just a few. But the way he structures the movie – with journalistic reveal after journalistic reveal – makes it the first that I have seen where the artifice actually serves to make the experience feel even more real, as paradoxical as that may seem. Whether you agree with me or not about that, there is no question that Tower illuminates important truths about the human capacity for good (and evil) and self-sacrifice that make it an especially important and timely film for our era of ever-increasing mass shootings. There are heroes in this world, as well as villains, and thanks to Maitland and company, we have the great fortune to meet the former and hear their stories.